Don’t have time to make a green smoothie? 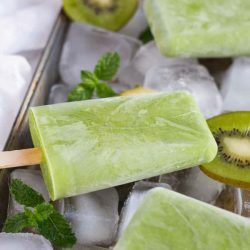 Keep a stack of these Green Smoothie Popsicles in the freezer for snacking on the go, and get a good dose of fruits and vegetables at the same time. You will also need 8 popsicle moulds - either commercial or homemade. Drain the water from the cashews. Place all the ingredients in a blender (or food processor). Blend the mixture for 1 minute, or until smooth. Pour the mixture into popsicle moulds and insert popsicle sticks into each mould. Freeze for 6 hours or until firm. ^ It is not necessary to soak the cashews, but they will blend into the mixture better with even a short soak.